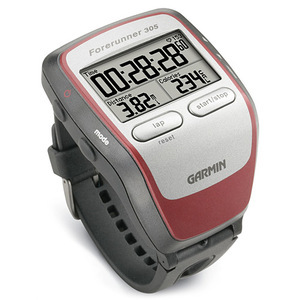 On episode 10 of the podcast I had half-jokingly made an appeal for both a Garmin and Apple sponsorship so I could get a Foreunner and an iPhone. Of course, those firms will not sponsor a back-of-the-packer like me, so I did it for the joke. I think I also promised to foster world peace if they gave me one. See, we’re trying to buy a house and any expense that we don’t really need, we are trying to eliminate. I have a birthday coming up, and I could afford to buy either the iPhone OR the Garmin, but surely not both. A few days passed and I received an email from a listener, two listeners–a husband and wife, in fact. They had both run Disney in January and both had Forerunner 305s. While at the marathon expo, one of them had purchased a 405 and they were left with this 305 that they no longer needed. They had even remarked to each other that it would be nice to give the 305 to someone who could use it. Then they heard episode 10. They wanted to give me the forerunner. I was blown away, humbled, and more than a little embarrassed. I felt slightly ashamed for begging like that. Offers by me to pay were rebuffed and I was encouraged to keep up the podcast as people were getting something good from it. What a great feedback, better than iTunes feedback for sure. I am now challenged to pay this kindness forward, to merit this great and wonderful gift from a fellow runner whom I have never met, but who shares this passion for running. I want to become a better runner, a more efficient runner. I want them to be proud of their gift and to never regret sending it. That is my challenge. This just proves that runners are the most awesome folks on earth! Hi there and that is very cool. I am Rae sitting here waiting for time to pass so I can get in! I will get with you when I get back. Keep posted and I will post pics and updates on my blog while here. I am flattered you want to interview me. I am not a front runner I am speed walking a 13.5 minute mile. If you have a call in number pass over and I will leave a message. That’s so generous of them! Pretty awesome! It’s like what Susan says. Runners are a pretty amazing bunch! That is a very cool gift! I’m enjoying your podcast- I did Goofy in 2008 and the Half this year with my mom. I just came back from the Princess Half. I know you are thinking about skipping Disney until Goofy in 2011, but put the Princess on your short list. It was a great race. Keep it up! Awesome!! What a cool thing. Runners are the best. 🙂 Enjoy that 305 and run hard!